It’s the Friday before Labor Day and with the family in tow, we start the 2.5 hour trek west to the farm. This can mean only one thing… Labor Day Hog Hunting. Years ago, Labor Day weekend was when we unofficially started our hog hunting season (and it usually ends on Memorial Day). Yes, I know you can hunt hogs year around but have you ever tried hunting in a hot, humid Texas summer night with a bazillion mosquitos around you? It’s doable but not really that fun, so Labor Day is when we traditionally start back up again. I’m really eager to get to the farm and start the hunt because on this excursion, I’ll be running a Trijicon EO REAP-IR on one of the “twins” (I’ll run a black IWI Tavor X95 in 300 Blackout with a Rugged Suppressor Surge 7.62 while Jonathan runs one in FDE with a SilencerCo can). I imagine this should be the perfect setup for us jumping out of a truck and stalking hogs in the cloudless West Texas sky. Soon we will test my theory. Trijicon’s REAP-IR is on the front rifle. Mounts are ZRODELTA, as are the tripod heads and front tripod. After unpacking and setting up the armory, I pull the REAP-IR out of the box to familiarize myself with it. My first thought? It’s as if my wife sent me to the grocery store to grab a one pound package of Kerrygold butter. The 2.5 times magnified thermal optic is about the same width, height and length of this familiar box of butter but slightly heavier. Saying all of that, it is smaller and lighter than I anticipated, while still feeling robust enough that I’m not afraid to drop it. Fortunately, the contours are designed to give you a sure grip, unlike the butter. The menu is very intuitive. The thumbstick system controller on the right hand side of the optic allows me to peruse through the different menus with ease. I won’t have to fumble around trying to find this button or that button somewhere on the thermal in the dead of night. Been there, done that. After scrolling through and selecting one of the several reticles, setting for black hot (vs. white) and choosing a contrast profile we leave the house to sight in the rifles. Pic taken through eyepiece. Distortion is not seen with you eye when using the thermal optic. The quick menu lets you customize functions that you want to immediately access. Is anyone else like me and you just don’t like the process of getting an optic sighted in? While it is a necessity, it takes time away from things I would rather be doing like hunting. Since it is a necessary evil, we used the Bullseye AmmoCam to help expedite the process. After several shots at our target and a little bit of adjustment, the REAP-IR is ready to go. We pile back into the truck and head back to the house to load all our gear and head out for the night. Before you jump in the truck with us, let me give you a literal lay of the land. We hunt on about 15-20 tracts of land that range from 100 acres to 640 acres of mostly grass or wheat fields. Do the math and you’ll see that’s a lot of ground to cover. We usually start at the field known as “The CRP” which begins our 25 mile roundtrip excursion to these different pieces of land. On most nights we will drive 2-3 “laps” where we scan these open fields for our four-legged friends, so having a thermal is a must and the REAP-IR was more than perfect for our adventure. But how can you scan easily when the REAP-IR has been mounted to the rifle? First, we’re using short X95 bullpup rifles that we can hang out the window as needed. But even better, the REAP-IR comes with a Mini DLOC mount made by ZRODELTA. It’s a return to zero mount that actually is spot on. Run the thumb wheel counter clockwise then depress the spring and you have a hand held 2.5 times magnified thermal monocular. Six seconds to transition. Reverse the process and you’re back on your gun, still zeroed. Sweet. There’s a Wilcox helmet mount on top, but it seems like that would be a big optic on your head. Note the helmet mount on top, the joy stick controller on the right side and the ZRODELTA Return-To-Zero mount. Within the first 30 minutes of leaving the house Jonathan says, “Hogs on the right!” They are about 300 yards away but we slowly roll the truck in neutral further east on the desolate county road to get closer. We exit the vehicle and I peek for the first time through the REAP-IR at our hogs and it is glorious. The image I’m looking at is UNBELIEVABLE. The picture is so crisp and clear that I could have counted each individual hair along the back of the hog. If a hair would have been out of place, I would have seen it. The only way I can describe it is to imagine you are looking at a 4K Ultra HD TV for the first time when all you’ve ever had is a 720p TV. The clarity and resolution is something that needs to be seen with your own eyes to believe. As I’m still awestruck by the awesomeness of the thermal, I scan the rest of the 260 acres because there was a chance that other animals were also in the field. No other hogs join the party, but I do see some rabbits hopping off in the distance. It’s pretty remarkable how easily I can detect and identify objects hundreds of yards away with this Trijicon. With the two hogs on our radar, we start the stalk. The wind is in our favor and although it is almost a full moon, the hogs have no idea we are there. Grazing on their midnight snack, the hogs are moving south and we’re moving a bit faster to close the distance. I keep tracking their movement on the REAP-IR and they remain oblivious to us. We decide to take a shot from 90 yards. We left the tripods in the truck so we opt to shoot from the kneeling position. Looking through the optic, the hog’s neck is lined up perfectly in my reticle and the countdown begins, “3-2-1-shoot!” My hog drops and I watch Jonathan’s hog run another 5-10 yards before going down. It’s a great start to the weekend. Jonathan returns to the truck to grab his camera and I am conveniently left with the duty of dragging the hogs together for pictures. We take the pictures and off we go to continue the SHWAT™ Wild Hog Eradication Program of West Texas. At this point in the night, I decide to swap out the two CR123 batteries. There’s nothing worse than getting ready to shoot and your thermal’s batteries die. Here’s a tip: Always carry a couple of spares in your pocket. As I was saying before you interrupted me… The batteries that were in the REAP-IR when I first pulled it out of the box weren’t brand new because Jonathan had been playing with it back in Colorado before he came down here. I really paid attention to the battery life because I’ve heard some thermals eat through batteries like Rosie O’Donnell tears through a box of Little Debbie’s. Usually, I will turn off the thermal while driving the loop between fields but I intentionally leave it on all night to see how long the batteries will last. My fresh set lasts from about 1:30 to when we shut down at 5:30. And let me tell you, I’m glad that I switched when I did because we’re about to see something pretty spectacular in the next field. We are now two miles south of where we shot the first two pigs. The Porcupine Egg field is empty and we pull into a little 120 acre field nearby. I see a couple of coyotes scurrying away into the thick mesquite trees as we take our first couple of steps onto the property. I scan east and, lo and behold, there’s a lone hog 275 yards from us. We hug the fence line on the north side of the property while we do our best to blend in with the brush. Even though it’s almost 1:30 am, the moon remains super bright. As we approach, I pulled up the stadimetric range finder on the REAP-IR. We are 70 yards away. Again, we left the tripods in the truck and this time shoot standing off hand. Boom! We can hear the subsonic Maker Bullets round pierce the flesh of the feral swine. It takes off into the brush and that’s the last we see of that hog, but not the last that we hear from it. We hang out for ten minutes and hear the hog succumbing to it’s wounds in the brush. Sometimes with hogs you don’t know what else, if anything, will show up. Is this hog truly a loner? Is it there just kind of checking things out for the rest of the sounder to see if it is safe to come out into the open? Unbeknown to us, those coyotes we saw earlier sneak back into the field and start yipping and yapping which alerts us to their presence. My first thought is, “Wow, that’s really loud and they must be really close.” As I take a gander in the REAP-IR, those suckers were about 50 yards from us. Lucky for them, we’re after hogs tonight. As the song dogs serenade us, I watch in amazement as I could see the hot black of their jaws move up and down as they howled while contrasted against the cooler white land behind them. The coyotes end up going back into the brush and we start our short journey back to the truck. Almost back to the property gate, for some reason Jonathan turns around and scans where the hog had just been shot. I don’t remember his exact words, but he basically says, “You’re not going to believe this!” See what I failed to mention is that my father-in-law told us earlier that night that there was a “Hog Highway” that exited on the northern part of this field and that the hogs were going through this property to some haygrazer just ½ mile north of us. This is his farm land and he notices EVERYTHING. If a deer poops on the side of a county road at night, I’m fairly certain he notices it the next day. We knew that these hogs were using this path to get from Point A to Point B, but we didn’t know when. I spin around and raise the REAP-IR to my eye and see the tail end of a 100+ hogs running down that game trail (aka “Hog Highway”). Pretty incredible! At that moment I really wished that this unit had built in video recording. You can cable up a DVR to it, which we got from Ultimate Night Vision, but we failed to get the Micro SD cards required… So pics are what we have to settle for. Thankfully, this wasn’t the last time we see this group of hogs. There are two more encounters with them over the weekend that I am sure you’ll hear more about soon here on SHWAT.com. Hog Highway is clearly visible in thermal. This was taken with the 1x IR-Patrol which we’ll cover more in another story. Speaking of Ultimate Night Vision, Jonathan introduced me to them a couple of years ago. We’ve used their rental gear on several occasions so I checked pricing on their website. New, they list the REAP-IR for $7999 and throw in $500 in accessories. In my world, that’s not chump change. I’ve seen them used on some forums, but UNV rents these for $300 for three days. Hard to argue with that! There are plenty of websites that can go into infinite detail on the tech specs of the REAP-IR, why the sensor pitch of 12 microns is a big deal and so on. 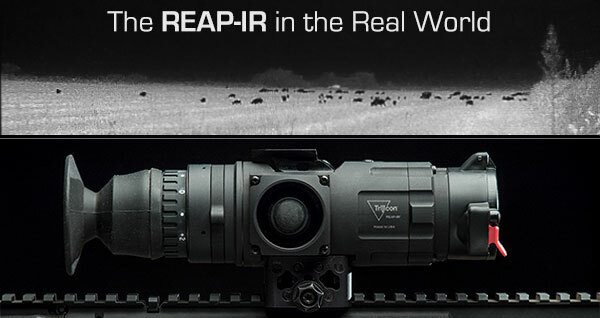 Here in the real world of West Texas where my father in law farmer has serious wild hog issues across sprawling plots of land, the Trijicon REAP-IR is a flat out rock star! Enough said. This entry was posted in The Accidental Hunter - Jared Hilton and tagged Hog Hunting, Hunting, Maker Bullets, Night Vision, Tavor, Tavor X95, thermal, Trijicon, Trijicon EO, Wild Hog, ZRODELTA by Jared Hilton. Bookmark the permalink. Great article, Trijicon thermals are amazing. As Jon knows, I run the IR Hunter MKII which is just as good as the Reap IR but the technology is packed n a more robust sized package and it has more traditional menu controls. I must say, the reap IR is light and about as handy as a pocket knife in a receiving department but the thumb controls on these darn units are a buzz kill. The screen frustrates me too. I cant see what menu I am in and the thumb controls skip all around when trying to navigate. With gloves…good luck! It makes me nuts. I have no idea why they (IR Defense) got away from those round turret like controls that quietly click when rotating. They are just the bomb IMO. The 60mm unit is topic for another day, I heard that unit is insane. It picks up heat unimaginably. Like Xray vision. Ah, the bullseye cam! I use bullseye cam for sighting in also but here is a trick for readers. You can also do a pretty good job sighting in thermal on a big dead stump or a large rock as the projectile will throw off significant heat when they hit. Shoot once to make a target, than shoot your own heat signature. Super fast, very easy. Bullseye cam is a great tool but if you dont have one, heres another trick…Use a handwarmer taped behind a shoot and see target. We use this technique in conjuction with the bullseye cam and sighting in is pretty fast and accurate.